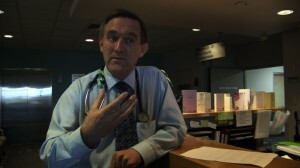 Dr Frank Brennan is a Sydney physician whose gift is caring for the dying and their families. Frank worked for the Aboriginal Medical Service in Redfern, as a paediatrician in South Africa, and for the Sacred Heart Hospice before specialising in palliative care. He has worked in Australia and Ireland. He has an interest in all aspects of palliative care including the interface of this discipline with the humanities. Inspired by his time in Ireland and the story telling tradition there Frank began to write narratives of encounters with patients and their families that had moved, challenged or humbled him. In addition he has written on pain management, palliative care and human rights. Read Dr Frank’s stories below. The warmth of the Dublin day caught everyone by surprise. Through the window I could see children playing in the garden. We had walked into the visitors’ room. The family was waiting. They were from County Meath. He was a farmer only fifty-four years old, she a teacher. They had seven children. It was clear that he was dying. He had battled seemingly intractable pain, but now over the past few days was much more settled. In many ways, of course, she wasn’t talking to us. She was speaking across the vast sea of their lives. I had spoken at a practical level about rest. The response I received was from a person adrift on that sea, not wanting to leave or soften the fate. Too often, as doctors, we speak practically and are heard emotionally. And perhaps that is our role. And in distant years if I ever were to encounter Angela Murphy again walking down O’Connell Street in Dublin, or perhaps George Street in Sydney, we would stop and no doubt remember the woman from Meath who spoke to us of a love that was boundless, a union that was indissolvable and who gave us a momentary glimpse into the mystery at the heart of it all. I met her at the main hospital. She had metastatic colorectal cancer. She had received extensive chemotherapy. Her disease had progressed and her options were rapidly diminishing. She was becoming thinner. I talked to her about palliative care and what the hospice had to offer. She agreed to come over to the hospice. I met Jack twice over the next few days. On each occasion, he sat by her bed, speaking as softly as she, his eyes burning with suffering. I had heard the question before, from relatives of other patients, at other deathbeds. I knew how the sentence would end. I was ready with an answer. I knew that the sentence would end with “a needle to end her suffering” or “a needle to put her out of her misery”. My answer, prepared and clear, would be no – that ethically and legally we cannot cause anyone to die or hasten their death and that the natural process of dying, already progressing, would inevitably lead to her death. I stood there. Silently, I reached out my hand to his hand that lay on hers. Three hands. I felt many things. Humbled that my expectations, the grooved furrow of the plough across the field of my working day, was not prepared for this question. That the question itself arose deep from his anguish of loss. That a lay person could honestly believe that we could do such a thing – wake a dying patient to speak for one last time. Have we so raised the image of modern medicine that doctors are seen to be capable of the miraculous? And I began to think of language – the language of our patients and their loved ones. How, occasionally, a comment or question can be both practical and metaphorical, literal and figurative. And how language can rarely capture the exquisite mystery present in the process of dying. Or is it so rare? Maybe we need to be more open to the asides, the whispered thoughts, the silence that so regularly envelops it all. And finally it reminded me that talk of death is not, nor should ever be, clichéd – that every encounter, just like every death, is unique and that our confident anticipation of the content of all encounters rests on a flawed premise: the premise of sameness. We will be surprised and humbled, moved and challenged. And rightly so. Time. The third time. It was the third time in an hour that I was speaking to a patient not yet fifty. Each had malignancies that were acting like runaway trains. Each had been told that no further active therapy was possible. And each had children. The third patient. Michael. I entered his room. Next to his bed sat his wife Karen and their two boys aged eight and eleven years. When I turned to greet them, the boys stood and shook my hand. Seriously and politely. Almost from another age, their courtesy disarmed me. I began by discussing the role of palliative care. We talked about the course of his illness. With his children present, I could see Michael was being circumspect. He was inviting the same circumspection from me. It was an unspoken truth that he was beyond cure. The scans showed me that the disease was widespread and aggressive. I was aware of the children sitting there. I asked them about their school. The subjects they enjoyed. Their sport. Whether their teachers were aware of their father’s illness. Carefully, I look at Michael’s boys. I see the future fracturing. It is breaking apart to re-form in another way altogether. I have a sudden image of them grown, now to old men thinking of their father, remembering and perhaps reminding each other of what things were like. We could talk about comfort and symptom control, meaning and dignity. But we couldn’t give them what they needed: their father. I try to find words of consolation. I cannot. I wanted to say that their father would always be with them. But that was precisely the point. Their father was here, but he would soon leave. My sorrow was as much for the potential of their relationship with their father as its loss. It is simply the incalculable loss of a parent. It is perhaps the most universal task: to fathom our parents. Some of us spend a lifetime doing that. But we need time. To lose a father or mother when we are young means that this process of mastering the mystery of our parents can only be based on fragments of memory and conjecture. To truly know them, perhaps we need to meet them as equals. And if not equals, then as adults. Life is difficult enough without the presence of one or both of those invisible guides. Not that those guides are perfect. We were not farewelling a saint. They were not saying goodbye to a paragon. The children were simply losing their father. I want Michael to close the laptop and talk to them. I want them to close their eyes and touch his face, his stubble, his eyelashes, his hair. I want them to remember. I want them to climb on to the bed and lie on him and place their ears on his chest. I want them to hear his heartbeat and his breathing. I want them to feel his shoulders and his back. But I want more. I want to say the words: “Father, these are your sons; sons, this is your father.” I want him to guide them, counsel them, warn them. And I want him to do it now. But I want too much. The life unlived cannot be lived in an hour. The air beside the bed was still now. The corridor was quiet. The room had softened. There is something unique about palliative care. That uniqueness can be highlighted and even brought into focus when we visit people at home. It is their place, not ours. We are ambassadors entering another country and we need to exercise all the rules of diplomacy. Equally, there is perhaps no better place to begin to know that person than sitting in their lounge room or on the side of their bed or talking in their kitchen. Three visits. The first is late one afternoon. A woman with advanced cancer. I knock on the door. She calls out that the door is open. I walk in. The heat of the day enters with me. She is sitting on a couch with a leopard skin pattern. She is not alone. The image of a man is everywhere. His image is on pictures on the walls, statues, brass plates and on a clock face. Directly above her is an enormous painting of the same man with an airbrushed halo around his handsome head. It was the image of Elvis. I felt I had walked into Grace-land. The carpet is thick and mauve. The stereo was quietly playing Suspicious Minds. The chorus lifted. She motions me to sit on the couch. She is breathless, weak, cachectic. She says she is “doing OK but it’s getting to be a struggle”. We talk about her symptoms and what management may be possible. Her husband walks in and sits next to her, his arm around her shoulders. I ask to examine her. Her husband helps her to walk to their bedroom. He sits on one side of the bed. On the drawer next to her bed is a lamp, the base of which is the King, white jumpsuit, down on one knee, hand extended. From the lounge room I can hear the second verse of In the Ghetto. A poster of Jailhouse Rock is on the wardrobe door. The second hand of the clock moves to the 12. All the other numbers are replaced with the letters that spell out Your Teddy Bear. The second visit. A sweltering day. A fibro house across the road from the railway tracks. I enter. In the lounge room is an elderly woman sitting in the corner. Directly above her is a wooden board in the shape of Australia. On it are spoons from multiple country towns sitting on metal pegs. The wooden piece that represented Tasmania had crossed Bass Strait. It was now within swimming distance of Port Philip Bay. The bedroom door is open. Her husband, the patient, is calling out something. The sound of a train clatters outside. Their daughter is unwrapping the framed certificate commemorating her parents’ sixtieth wedding anniversary. They had lived there all their married lives. We talk. The patient’s wife says: “Doctor you look thirsty. I’m sorry I can’t get around too well. Why don’t you go into the kitchen and get yourself a drink.” I stand up. My legs are heavy with the heat. I walk into the kitchen. I pour a glass of water from the tap. I turn around. Directly above the laminated kitchen table are four large photos. They are deliberately positioned. At the top, alone, is a picture of the Pope. Below him and arranged at an equal level are framed photos of Don Bradman, Phar Lap and Les Darcy. The third visit. I had been warned. He was from Liverpool in England. He was a recluse, a recovering alcoholic and a difficult, uncommunicative man. He had missed multiple medical appointments. He drove everyone away. He had verbally abused at least two nurses. His poor wife, the nurses say. Under the bedspread, with the blankets pulled up, is the top of a head with red hair and grey flecks. I introduce myself. The head does not move. I explain that I am here to discuss his pain and try to make him more comfortable. One blue eye turns to me. He asks: “Who sent you? Whoever it was, you’re wasting your time.” He turns his face to the wall. “I’m sorry, doctor,” his wife whispers and leaves the room. His tone was not anger. Simply exasperation, almost weariness. I sat back and surveyed the room again. On the ceiling, his wife had carefully placed the solar system with the planets aligned from Mercury to Pluto. There was a long pause. I realised I had a choice: to leave now or face this silent man, his back now turned, and risk infuriating him. I sat still. In the distance I could hear a neighbour starting up a lawn mower. A truck passed. Idly, I looked at his notes. My eyes drifted to his year of birth: 1941. I stared at the date. I recalled his origins. No answer. Slowly his head turned. “Dozens of times.” He replied as if to a child. To him it was an obvious answer. “Did you know any of them?” I asked. “And,” he said, now sitting up and adjusting his pillow, “I guess they lost interest in me when I became infamous.” He smiled to himself. “And Stuart Sutcliffe?” I asked. The last patient of the week. Their needs may be quite simple. The routine conversation. The automatic response. But it may be that this patient will be the most challenging of the week. The one patient that will stretch you to your limit. The one family that the god of medicine will send to test your resolve. Equally, it may provide the opportunity for noble medicine. The last straw, or the greatest consolation. He was an elderly man. The fates had gathered. His organs were failing. When I walked into the room, I could see he was deeply unconscious. His hand held the top of the sheets. His fingers were long and thin. A bruise purpled his left temple. A plaster stretched over it to the corner of his eye. A recent fall. Maria, his granddaughter, sat in the corner of the room. She rose when I entered. We talked about the last few days. Her mother and sister were at home now, exhausted and trying to rest. She spoke in a half-whisper, the lowered voice clearly in deference to her sleeping grandfather. Volume as respect. As a family they had managed everything well. They were prepared. In many ways, as she described him over the last four months, he had been preparing them. Almost idly, I looked at the name above the bed and asked where he was from. Greece. Normally, I wouldn’t ask too much beyond that, but I did. Whether it was the calm atmosphere of the room, the gently breathing man, the tranquil and sad eyes of his granddaughter or the fact that my working week had finished at this point, I allowed myself to be curious. I asked where in Greece he was from. She seemed surprised that I knew. She walked over to the bed and, reaching out, touched her grandfather on his right shoulder. We talked some more and then she said: “He used to say that everyone from Kos had the hands of healers. As children, we believed him and would show off our hands to our friends …” her voice trailed off. Her voice became softer. She reached out to his hand. I thought of Hippocrates and the great physician-teachers of the ancient world. Of their legacy and the great library at Alexandria, where so many of their writings were gathered and compiled. And I thought of Hippocrates himself, doing his rounds, visiting the homes of the sick and dying, doing good, avoiding harm, speaking quietly, observing everything and never taking advantage of his position. He was here, of course. If he could speak to me in that room, I’m sure he would have reminded me that the first and last patient of the week deserved my time and professionalism equally. And I would have agreed. She smiled and looked over to him. She brushed the hair away from her eyes. She placed a small, framed photo she was carrying on the bedside table. She bowed over and kissed him on his forehead. I looked at her hands. She had the hands of her father. The mid-afternoon corridor was quiet. A large bouquet of flowers, well lit from all angles, was paraded down to the patient’s room. Boxed in red, the flowers sprang from all ends of the spectrum in purple, orange, green and yellow. It was a competition of colours. The clinical history that was being presented to me appeared straightforward. Mrs Webster was a ninety-five-year-old woman. She had a quiet medical history until recently being diagnosed with extensive Non-Hodgkin’s Lymphoma. It was decided, given Mrs Webster’s relative frailty and age, that she would not receive chemotherapy. It was a wise decision. At 95, you deserve to be left alone. You have earned your peace. To this point in the conversation, there was no concern. The problem lay in the next surprising piece of information. The patient’s daughter had asked that her mother not be told of her diagnosis. I had encountered this many times before. But what I was genuinely surprised about was that this request for non-disclosure came in the context of a ninety-five-year-old. At that age, you would expect death would be at least anticipated, if not greeted warmly. We walked down the corridor to meet the patient’s daughter. She was an only child. She was nervous and pre-empted any discussion by saying: “I understand who you are, but my mother is a very anxious person and if she knew what was happening, she wouldn’t be able to cope.” I invited the patient’s daughter to come into a side room and sit down with us. I pointed out to her that her mother had experienced a long life and almost certainly encountered many tribulations and disappointments through that life. Her mother would probably deal with this news in the same way she had dealt with her past sadness. People respond to this news in appropriate ways – upset, sadness, grief even anger. But I assured her that I was sure her mother’s response would not be excessive or disproportionate to the news. I also said that, at ninety-five, she had lived through two world wars, the Depression and had probably survived the loss of many family members and friends. Death was not unknown to her. And finally, at ninety-five her own mortality was, I was certain, something that her mother had, however fleetingly, considered. This did not dissuade the patient’s daughter. I went on to point out that there were both ethical and practical dimensions to truth-telling and transparency. In terms of the ethical basis for truth-telling, there is a high value of truth in dealings between people. Also, there was a relationship of trust between a doctor and a patient and that this was founded on transparency and disclosure. Finally, I reminded the patient’s daughter of the principle of autonomy and that it was her mother’s body, mind and spirit that we were discussing, and that her mother should have control over that from all perspectives. I then proceeded to discuss the practical dimensions of truth-telling or the opposite. Firstly, I discussed the role of informed consent. It is impossible to give an informed consent for any treatment if one does not have sufficient information regarding the treatment and its risks. In this case, Mrs Webster was not having any active therapy for her lymphoma. Nevertheless the principle stood. Equally, it is important for patients to know their diagnosis so that they can at least, in some way, participate in their treatment options. Finally, and perhaps most importantly, I pointed out to the patient’s daughter that the disclosure of the diagnosis of a life-limiting illness would allow her to prepare. This may include reconciliation with family or friends, resolution of practical, emotional and spiritual issues, and finally discussion and finalisation of legal issues including making a will and, where appropriate, organising business affairs. Procrastination about disclosure may mean that all the significant issues of preparation for dying are not tended to, or at worst rushed in the pre-terminal or terminal phase prior to the patient’s death. The daughter remained insistent that her mother not be told. We all then went into her mother’s room. The patient lay on her bed. I sat on the edge of the bed. The daughter sat on a chair beside the bed. I began to talk to the patient and when the conversation veered close to a discussion of the diagnosis, the daughter kicked me. There was a long pause. Silence. There was a triangulation of awareness. I knew that I had been kicked. The daughter knew that she had kicked me. The patient knew that something had happened. My eyes did not leave the patient’s. The silence, now heavy, continued. I hoped it gave the daughter an opportunity to think about what she had just done. It is at times like these that moments of quiet reflection are in order. Eventually, and without taking my eyes off the patient, I broke the pause – not by speaking, but by moving. I repositioned myself along the edge of the bed, now at a strategic distance away from the daughter’s shoe. As the discussion again veered close to the precipice, I could see in my peripheral vision the long arc of a second kick coming towards my shin. About a week later, Mrs Webster was transferred to the hospice. Her daughter visited every day and sat by her mother’s bed. Protecting, quarantining, a wall around her mother. I explained clearly to Mrs Webster that she was in a hospice, that I was a palliative care physician, that the large mass on the left side of her abdomen was a spleen and that it was abnormally enlarged. The daughter sat through these conversations, her lips pursed. I discussed her medical history. I asked for a list of her medications. She left the room. My eyes wandered over the bookshelves. My Brother Jack, The Fortunes of Richard Mahony, For the Term of his Natural Life. Australian classics. I was intrigued and looked further. As I spanned the shelves, I saw Australian novels, neatly grouped from colonial times onwards and there, in a brilliant line, Australian poetry from Lawson to Murray and, below them, the plays – all the plays that I could think of and more, from The Summer of the Seventeenth Doll to Michael Gow. It was a formidable collection. It seemed to me neither heavy nor ponderous. It was a happy and loved collection. As I looked closer, I could see that so many of the books, especially the poetry, had been picked out, creased over and placed back. I turned to the shelves and said that she had an impressive collection of Australian literature. “Do you have favourites?” I asked. “And much can be left unsaid,” she replied. We talked of Slessor and Murray, Hope and Brennan, Dransfield and Dobson. She spoke with a quiet enthusiasm, as though of close friends. And, like friends, it was to poetry that she had turned often – especially for solace. I was conscious of her breathlessness and suggested she rest. She said that she was fine and, with a small wave of her hand, continued. I am glad she did not stop. It was, I suspect, unique for her to talk back and forth across the breadth of her bookshelves, literally touching on the gift of language that was both her profession and her passion. I pointed out Judith Wright. “Yes,” she said. “One of our great poets, a woman of conscience.” I told her that recently I had read Sonnet by her to a group of doctors. I recommended it. Ten days later, her grandson held up a service station. It was an armed hold-up. He was now in a juvenile detention centre. I rang her. She didn’t say much. “It can’t get worse, really. Just when things seemed to be improving.” I could hear her breathing becoming much more laboured. The days unfolded. A routine. On the ward rounds, I would sit beside her and talk. Mostly symptoms, occasionally literature. Her daughters and her husband would sit and talk about their lives together. Occasionally, I would hear laughter from the room. One Saturday morning, Margaret’s grandson was brought, under supervision, to the hospice. He broke down and cried and said how sorry he was to her. They spent a long time together. During that week, we spoke several times. Once she said that when she died she wanted me to go to her study in her house and choose some books. One afternoon, I walked into her room. Her husband stood near the bed. She sat in a chair that looked out on to the grass that sloped down to the lake. The heat, the swans, the flat, still water. Would all hospices have the calm that being surrounded by water brings. She spoke of the beauty of the world. Margaret died four days later. It was the week before Christmas. After the funeral, the daughters rang. They invited me over to their parents’ house. I sat with them and talked about the funeral. The music, the eulogies, the readings. Talking over funerals can be almost as important as attending them – the sense of ritual and commemoration. Several people spoke, including a woman whom Margaret had taught in a small country town school. That year, this pupil had topped the state of New South Wales in English in the Higher School Certificate. They described her talk as “eloquent and beautiful”. When we had finished, they asked me to come into the study and choose some books. I said I was very reluctant, that these books belonged to their family. They insisted. I walked into the room. This was now a sacred place. The same desk overlooking the garden, the same shelves, the same warm collection, if anything, even more impressive than I recalled. Katherine Susannah Prichard, Charmian Clift, Oodgeroo Noonuccal. A life’s collection. I called her daughters in and said: “No, I can’t take any … this is a collection that should remain intact. It is wonderful as it is.” They told me that none of their family would take the books. We began to think of places that may. High schools. Here or overseas. After some discussion, the consensus seemed to be that Australian children would probably appreciate this overwhelmingly Australian collection the most. and bird and tree are simple and stand still. the luminous fields of sunset for your bread. and shadow brims the hillside slow as sleep. draws on the night at last; the dream draws on. Sub-Saharan Africa. The heart of the HIV/AIDS pandemic. Tens of millions infected. Millions dead. Rising numbers of orphans. Economies rifled. All compounded by recurrent famine, government myopia bordering on criminal neglect, personal denialism, struggling resources, fatalism, inadequate education and a widespread belief in bewitchment as the true cause of the disease. I am visiting South Africa for the first time in a decade. The last visit was a year after the near-miraculous transition from the government of Apartheid to a democratic nation. People then were using expressions like “in the New South Africa”, “truth and reconciliation” and the “politics of forgiveness”. Nelson Mandela was President. All eleven languages were official. A new flag. A decade later and the harsh realities are everywhere. Port Elizabeth struggles. There is high unemployment. The sprawling townships of shacks lie beneath the endless sunshine. The sense of torpor, the frustration. Letters to the Editor complaining of bureaucratic ineptitude. I am taken out to Kwazakele. A huge township. Through the days of apartheid, it was the site of a large presence of police, army and security forces. Nightly raids, shootings, tear gas, detentions of anyone who voiced dissent. Babies and toddlers presenting to the local hospital with tear gas pneumonitis. A seemingly endless cycle of shootings, funerals for the dead and then further shootings at the funerals. The entire teenage population boycotting school with the chant “Liberation first, education later”. I remember it. I remember it well. For two years, I worked at that hospital. I am being driven out to a community centre. There the local palliative care nurses gather each week, provide their patients with a meal, HIV/AIDS counselling, anti-retroviral medication. A doctor attends. Today is a special day – it is the annual Christmas party. A nurse explains that, because of the poverty in the area, this may be the last substantial meal they have until the clinic reopens in the New Year. In a street with few vehicles, I am surprised to see a white stretched limousine pull out into the road in front of us. The nurse explains that the richest business in Kwazakele is the undertakers. I look more carefully. It is a hearse. We drive past the cemetery. In the brilliant glare, I see an ocean of crosses stretched out, some flowers moving in the wispy breeze, ribbons, photos, mounds of earth. The nurses at the centre greet me warmly. They are formidably well informed – statistics on prevalence, the national anti-retroviral rollout, the care of opportunistic infections, pain management and symptom control. One nurse leads me into another room. About fifteen adults are there. Some standing, most sitting. All have AIDS. The nurse asks each their CD4 count. All know. They speak Xhosa, the local African language. It is Mandela’s mother tongue. The nurses translate for me. I thank them for having me on this day. I wish them a Happy Christmas. We are all ushered into an adjoining hall. At one end is a mural of African village scenes. A large table is set with Christmas decorations. Members of the group arrange themselves behind the chairs. With the barest hum as a prelude, the group begins to sing. I had forgotten the power of this – the harmonies, the baritone of the men, the altos, the effortless melody, the surging sound of a group in perfect synchronicity. Of course, I have heard this singing before, but never this close – to pick the individual voices, to sense it like a moving thing. This close, I feel I have been drenched in sound. They sit down. The senior nurse says a prayer. She thanks me for attending. She turns to the group and invites anyone to speak about the meaning of Christmas to them. The weeping continues, deepens. Now the whole table is crying, men and women. The nurses come to comfort them, holding them around their shoulders, touching their faces, their hands. The weeping goes on like a torrent. Of course, it is individual but it is also collective. There is an African word – Ubuntu. The people as a group. We, together. The sense of the collective. The tears of each are now one. Cry the group. Cry Kwazakele. Cry the Beloved Country. It goes on. The sobbing now sounds like a storm, soaking us all. It rises, dips and pauses, then is caught in the draught of the sound of crying from each end of the table. I feel I am being lowered into a well of sorrow. I can see the sides, but cannot touch them. The light is fading. The sound of the crying sounds like a choir. Throughout, the nurses are dry eyed. Having worked here, I know that there is a strong professional convention, as a nurse, not to cry in front of patients. I turn and see the eldest nurse in the kitchen behind us, near the wall, out of vision of the group, with a tissue in her hand. It is the sight of this tall woman, sitting on a small stool, quietly, secretly crying beyond the view of the group. She composes herself. She stands and re-enters the room, calm, a small smile upon her face. She walks over and lets out a long call, stamps one foot, raises her hands over her head and claps them twice. It is a signal. They stand as one and, following her start, begin signing again. Oh the beauty. The beauty of their song. Their faces lifted, their eyes closed. I would invite all those in the West who scorn Africa as the hopeless continent, who would ignore the pandemic, to come. I would invite them to Kwazakele. To sit and have lunch with this group. To listen to them, to visit their homes, to play with their children, to read to the orphans. I want them to walk down their lanes, to go to their gravesites. The long open fields of crosses. I want them to come to Kwazakele. Come. In the seventeenth century, John Donne wrote: “No man is an island … Any man’s death diminishes me, because I am involved in mankind, and therefore never send to know for whom the bell tolls.” In this century, the bells of Kwazakele toll for us all.